Below are possible essay topics on The Catcher in the Rye. Bear these in mind as you read, as we will inevitably come back to these when we’ve completed the book. Be ready to present your findings to the rest of your group. See the photo gallery at the bottom of this page for more images from the time. In our classroom discussions we have talked a lot about the narrative style, as Salinger tells the story through the voice of a teenager. The best way to understand how this really works is to try it yourself! Using the document below, try to write a short piece of creative writing in the voice of Holden. Have a look through the document below, and research ‘Dear Abby’, or similar problem pages, if necessary. Then try to give poor Holden some sound advice. 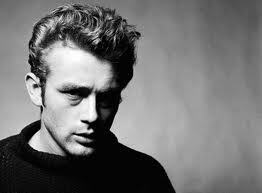 You can base this on the chart you have received already (‘What makes Holden depressed?’). Now that you’ve all finished reading the book, here’s a plot summary to help you remember key events. In class, we are going to practice some ‘close analysis’ of a few key passages in ‘The Catcher in the Rye’. Here are a few examples; please use those we don’t study in class for your own practice. Ban this book! You may be surprised to know that ‘Catcher in the Rye’ is still banned in some libraries in the US. 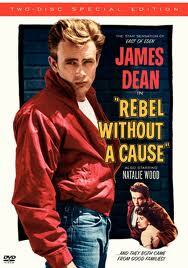 Yes, in some schools, libraries, cities and states in the US, the book you have just read is banned. You would not be able to find it on the bookshelves and would not have the chance to study it (great, you say!). In fact, it is number 6 on the most banned books list this year (see the link below for the Top 10). Why is this? What do you think about it? Did it shock you? Did you think you, as a teenager, should not be exposed to such a ‘filthy, filthy’ book as this? Add comments below. FOR: Parents who are outraged that our school library has ‘The Catcher in the Rye’ on its shelves and want it taken off. AGAINST: English A2 teachers who believe that the book should remain available to students. IN THE MIDDLE: The school director, trying to keep the peace and see both sides of the argument. We will choose sides and prepare arguments. This activity is for practice only, to introduce one form of Further Oral Activity to you. However, before we begin, it would help you if you have a look at the assessment criteria on the main page of this Wiki (see criteria for ‘oral’). Return to the sample essay topics at the top of this page. Choose one (it may be the one you chose in our lesson on when we compared essay plans, or it may be a completely different one). You will write an essay on this topic in class. Watch Veracross for dates. You may prepare your ideas before the lesson, and bring notes with you into the class. You will not, however, be allowed to have a copy of the book with you! This will be formally assessed: the criteria are on the main page of this Wiki (see the criteria for ‘essay’). Now that you have read and discussed the book: what do you think about this? How about writing your own sequel? Have a go at the first chapter. Perhaps these photos below will give you a feel for the times. ‘The Catcher in the Rye’ was written and first published in the late 1940’s, but it is with the 1950’s that it is most closely associated. 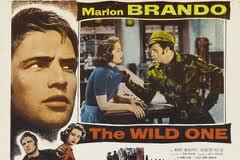 Film posters for ‘The Wild One'(above) and ‘Rebel Without A Cause’ (below). 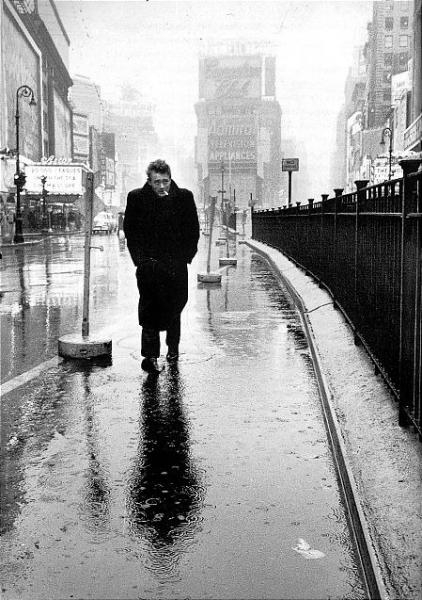 James Dean again in the streets of New York, looking very much as poor Holden might have looked (below). 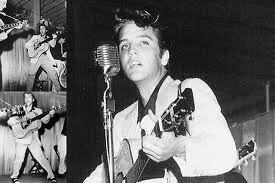 Music: Elvis Presley, the face of rock n’roll (above). Photographer unknown. 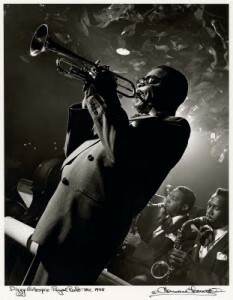 And one of the stars of Holden’s favourite bebop jazz: Dizzy Gillespie (below). Photo: Leonard Hermann. 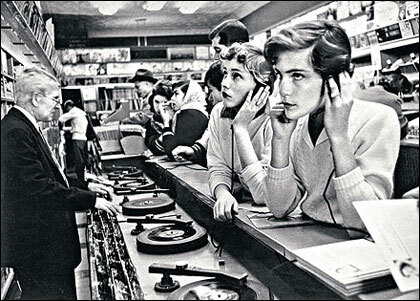 Teenagers in a record store listening to music before buying (above). Photo: Esther Bubley, Magnum Photos. 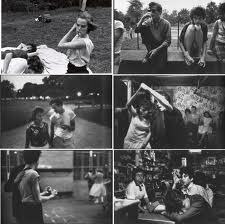 And teenage gangs in 1950’s New York (below). Photo: Bruce Davidson, Magnum Photos.